Models in bathing attire were a favorite subject of Vogue regular George Hoyningen-Huene, below we discover more of his photography from the late 1920's and early 1930's in black and white. 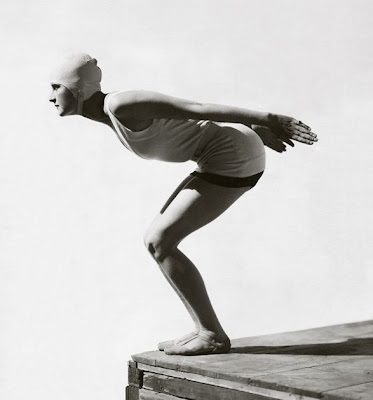 George Hoyningen-Huene captures a model on the brink of a dive in this photograph, which appeared in the July 6, 1929, Vogue. She wears a white belted jersey tunic over black swim trunks by Jean Patou, a signature two-piece style of the era. This image of model Agneta Fischer by Hoyningen-Huene appeared in the July 1, 1931 Vogue. She is wearing a hand-knit bathing suit by Elsa Schiaparelli. 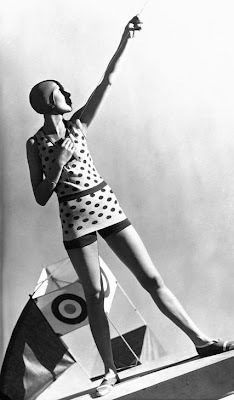 The model wears a polka dot wool jersey bathing suit over navy shorts with a swim cap and striped beach shoes, all designed by Jeanne Lanvin. The image by Hoyningen-Huene appeared in Vogue on July 1, 1928.